Our boat started to take somewhere in the middle of the deep lake. At first, it was only a little; but as time went on, the bottom of the boat started to fill. My cousin Johnny pushed the small, battery operated trolling motor to its limit to get us back to shore. Meanwhile, me and my buddy Haystack desperately tried to scoop the water out of the boat with our hands. (I immediately regretted not bringing my bucket.) Our efforts seemed futile because we took in more water than we were able to bail out. “We’re gonna sink!” I shouted. “I’m just gonna tell you now… I can’t swim!” Haystack replied. The sound of panic in his voice became as obvious as our situation. My buddy didn’t get the nickname “Haystack” for nothing. He was a good 6’2” and weighed at least 275 pounds. If the boat sank in the middle of the lake, he would panic. I’d heard the old axiom that the biggest danger of saving a drowning person is the possibility that they often take their would-be rescuers down with them. Johnny stretched the boat motor to its limits while Haystack and I bailed water as best we could. By some miracle, these desperate efforts were enough to get us to shore… almost. That pathetic little aluminum rental boat finally went down. Thankfully, it sunk in a shallow channel about 20 feet from shore. The three of us walked out of there in waist-deep water fully aware that the small rental boat was not big enough to accommodate three grown men. While my situation was scary, it was nothing compared to someone falling overboard at sea. I can’t even imagine the terror that someone would feel in that situation. For many people, no matter how loudly they shout and yell, the boat that they were just one rapidly sails away from them. Even if the boat crew knows that someone fell over, it can be extremely difficult to find someone who’s lost in the water. 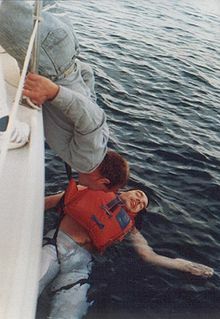 Whenever I discuss boating safety, I’m reminded of a tragedy that I witnessed as a young man. It happened more than 30 years ago, but I still remember it like it was yesterday. My cousin Johnny and I were staying at our grandparents’ lake cabin. For us this meant swimming and fishing every day, which is where I developed my love for the water. The lake was also a popular boating spot for many of the locals and their friends. The tragedy occurred one summer when a group of 20-somethings were partying on their parents’ boat late at night. In their rush to make it back to shore, the young man crashed his father’s boat into a floating raft. This sent everyone into the water, and none of them wore a life vest. All the young people were safe except for one – a young woman in her 20s. The crash knocked her unconscious and tossed her into the water, where none of her friends could find her. The police were called and the tiny little cove where our grandparents lived soon buzzed with activity. Johnny and I were among the crowd that watched the sheriff’s department dive team search the lake for the young woman’s body. The darkness and low visibility of the silty water made finding her impossible. The search was called off sometime after 3 AM and we all feared the worse from this incident. I wish I could say this story has a happy ending but it doesn’t. About three or four days after the crash, the young woman’s body was found floating face down at the far end of the lake. It was a couple of kids who were out fishing – just like Johnny and I had done many times – that found her. Our parents used this as a teachable moment to warn use about the dangers of being out without life vests, among other things. Needless to say, Johnny and I didn’t heed those lessons the day we sunk the boat with Haystack on board. “Man overboard” are the last words you want to hear if you own or operate a luxury vessel or working craft. Fortunately, there is something that helps your crew stay safe, and even helps rescue workers locate them if they accidentally fall into the water. It’s called a personal locator beacon, also known as a man overboard beacon. This is truly the best and safest way to protect yourself and your crew should the unthinkable happen on your boat. 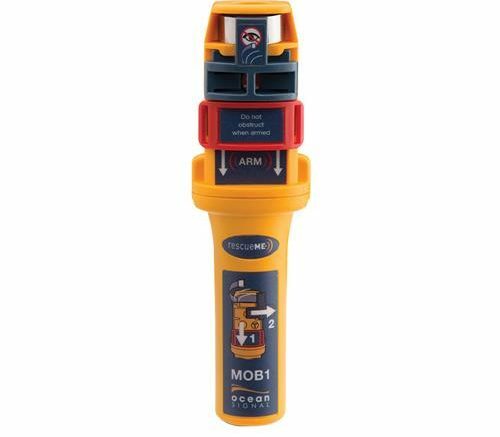 The Ocean Signal AIS Emergency Rescue GPS personal locator beacon is an automatic identification system (AIS). This GPS rescue beacon device easily fits into most life jackets and life vests. It is designed to go to work the moment a life vest is inflated. When this happens, the beacon’s GPS system automatically alerts the crew of the incident over the vessel’s VHF radio. It also tracks the person’s position in the water to aid rescue efforts. This personal locator beacon also has an integrated strobe light and a host of other helpful features. Check it out. If you own a luxury vessel or working craft, you need the Ocean Signal AIS Emergency Rescue GPS device. It’s one of many personal locator beacons that Solid Signal carries. This device is more than just a purchase, it’s an investment in your safety and the safety of everyone else on your boat. It’s well worth it to make the investment in something that could end up saving a life one day. We stock our inventory with these beacons from Ocean Signal, ACR, and others to you stay safe on the water. If you have any questions about these marine safety products, don’t hesitate to give us a call at 877.312.4547. Solid Signal’s team of marine equipment experts look forward to helping you choose the right personal locator beacons. Shop Solid Signal for the best selection of marine products! Welcome to the All New SignalMarine.Com!